The answer is definitely D. In customer service, you help other people like it’s your job, because it is your job. Whether that includes helping customers with a particular product, fielding questions and complaints with a pleasant smile, or listening to people rant and rave about a product you didn’t sell them and didn’t create, it’s a role that requires a ton of people skills and diplomacy. You’re often a front-line brand ambassador for your company. In the best of times, you might earn loyal customers for your company. When things go wrong, you might end up a viral cautionary tale of customer service gone wild. So remember: not for the faint of heart (or patience). It’s important to note that this is not your typical 9-to-5 job. Depending on the industry or company, you may be working odd or overnight shifts, including holidays and weekends. What Does the Customer Service Career Path Look Like? 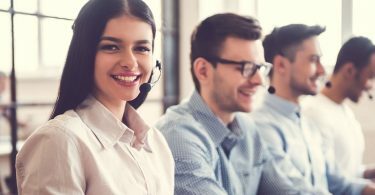 In the past, customer service was often looked upon as an entry-level job, or a career dead end, but that is no longer the case (if it ever really was). Many customer service careers start in the aforementioned entry-level job (customer service rep, or any associate-level job), but with experience in the field, a person can go on to become a coordinator, manager, supervisor, or executive). As we become a more consumer-driven culture, and one where a customer can be blasting a poor experience over social media within seconds, that means that the customer service industry is growing and becoming more sophisticated by the day. 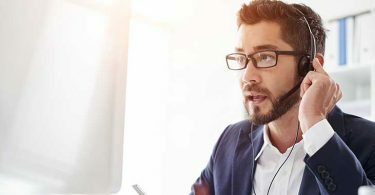 Customer service representatives are not just for placating customers—they may be troubleshooting complicated issues, using advanced technical skills, and using a variety of different communication platforms to connect with customers. The data obsession that drives so many other industries has taken root in the customer service field as well, with metrics, reporting, and customer data management becoming more complex in the pursuit of generating sales and creating lasting, positive relationships with customers. What Skills Do Customer Service Professionals Have? Remember when I mentioned “people skills”? These are among the most essential skills for a fulfilling and productive career in customer service. Here’s the rundown of the skills you’ll need (or should build) if you’re looking for a job in the field. You’ll be communicating with all sorts of people. Happy customers with questions, unhappy customers with problems, people who have very few communication skills themselves, people with language barriers, people who just want to talk to someone…you name it, you might encounter it as a customer service professional. If you’re one of those people who can have a conversation with anyone and everyone you meet, great! You’ve got a good starting point. Your communication skills shouldn’t just be customer-facing, though. You may need to explain complicated issues or problems to other teams within your company, and will likely need to be able to communicate brand-specific messaging as well. Your written skills should be strong as well, because so much customer service happens online these days, either via email, online chats, or social media. If you’re a tech-savvy person who has tried to help someone who’s, uh, less tech-savvy with a complicated computer issue, then you know that being the one with all the knowledge comes with great responsibility—namely, not getting frustrated or yelling if the person doesn’t necessarily get what you’re putting down. Being able to stay calm and walk through things as many times as necessary is an essential skill for customer service. Customer service reps may need to do a lot of juggling, especially during busy times of the year (for example, holidays). Being able to keep customer information straight and make sure you’re logging everything accurately is key. Chaotic or frenzied customer service is usually lousy customer service. Because customer service actions can have consequences with customers, companies like to make sure that their customer service reps and contacts have an eagle eye for small details. Whether it’s making sure an order is being processed correctly, or ensuring that someone’s insurance information is accurate, you’ll want to be able to demonstrate ninja-level attention to detail. What Education Do Customer Service Professionals Need? This is a field that you can get into without a degree. Most customer service jobs, especially entry-level ones, require a high school diploma or equivalent, and rely heavily on candidates who demonstrate the kinds of skills outlined above. There is typically on-the-job training, since every industry and every company have their own customer service needs, processes, and policies. There’s no one-size-fits-all training or certification that customer service professionals can undergo. How Much Do Customer Service Professionals Make? What is the Outlook for Customer Service Professionals? The outlook is strong! This is a field that is definitely growing—again, the emphasis on a consumer society means there will always need to be consumer support professionals. The U.S. Bureau of Labor Statistics predicts that this field will grow 10% faster than average by 2024. If you’re thinking about breaking into this field, or wondering where you can go next after your first opportunity, working in customer service can be a solid growth choice for your career. And if you’re not necessarily interested in making it your career base, the skills you use and build as a customer service representative are ones that you can successfully take to many other industries.